These new competitors to blockbuster biologics medicines promise to save money for healthcare systems, and create ‘headroom’ to allow innovative medicines to be adopted. However, there are clear signs that uptake is patchy across the NHS, and are the savings generated from use of biosimilars supporting the uptake of innovative new medicines or simply ‘filling the potholes’ elsewhere in the health service? Will the UK realise the maximum level of saving from biosimilars? What European countries are leading the way in biosimilar uptake, and can the NHS emulate them? Will the industry continue to invest in cutting-edge research in the UK if the NHS isn’t prepared to fund access? In a post-Brexit world, can the UK continue to be a leader in cutting-edge biologics research? 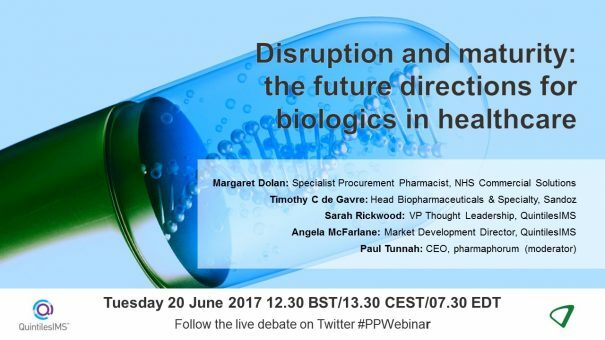 The webinar brings together key stakeholders from the NHS, pharma industry and QuintilesIMS, who provide data, analysis and policy insights to provide a clear picture of future UK market trends. The live webinar took place on Tuesday 20 June at 12.30 BST/13.30 CEST/07.30 EDT. To register to view the webinar on-demand, please click here or on the button above/below. Maggie achieved her BSc in pharmacy at Heriot-Watt University, Edinburgh, and a diploma in clinical pharmacy from Strathclyde University in 1991. She has many years of experience as a hospital clinical pharmacist, primarily in Scotland. She was Chief Pharmacist in Edinburgh in both the adult (West Lothian NHS Trust) and paediatric (Edinburgh sick Children’s Hospital) settings over the period 1993–2005. Throughout her career, she has developed a keen interest in the safe, effective and cost-effective procurement of medicines to the benefit of both individual patients and the NHS economy. As pharmacy advisor to National Procurement Scotland she was seconded to the Scottish government to work on Pandemic Flu Preparedness. Her current role is as Regional Medicine Procurement Specialist for the South East Coast. She chairs the NHS Biosimilars Group, the Purchasing and Distribution Interest Group and is a member of the Carter Review Group as co-chair of the contracting theme. Tim de Gavre is the Country Head of Sandoz UK. Sandoz is the biosimilars and generics division of the Novartis Pharmaceutical Group. Tim de Gavre is currently Chair of the British Biosimilars Association (BBA), the expert group which represents manufacturers of biosimilars in the UK, a position he has held since 2016. He has recently been elected as the Vice-Chair of the British Generics Manufacturing Association (BGMA). Mr de Gavre has been appointed to the position of Country Head following several years heading the Specialty Team within Sandoz UK. He has worked within Sandoz for 7 years, initially joining as the Global Head of Strategy for the Biosimilars Business Unit, based in Holzkirchen, Germany. Overall, Tim brings almost 20 years’ experience in healthcare, including in consulting at McKinsey & Company and in healthcare venture capital with Frazier Healthcare Ventures. During her time at QuintilesIMS, Sarah has played a key role in developing the Launch Excellence thought leadership studies and Launch Readiness offerings which provides comprehensive and critical guidance to QuintilesIMS’ pharmaceutical clients during the crucial pre-launch and launch periods for their key brands. In particular, she has advised companies on the launch of current and potential blockbusters in many therapy areas and countries.